KIEV, Ukraine -- On 2 January, UkrOboronProm (UOP) released an article detailing its defence developments over the past year, including tests of several armoured vehicle upgrades, an air defence radar and a precision guided missile system. The T-72AMT on display at the Arms and Security Exhibition in Ukraine in 2017, upgraded with protection from the T-64BV and a new, more powerful engine. Along with other developments of advanced weapon systems, the report shows that the Ukrainian defence industry is growing. The release details advances made with the BTR-4MV1 infantry fighting vehicle and the T-72AMT, a deep modernisation of the T-72A. Both developments are based on experience gained in the war in the Donbass region. 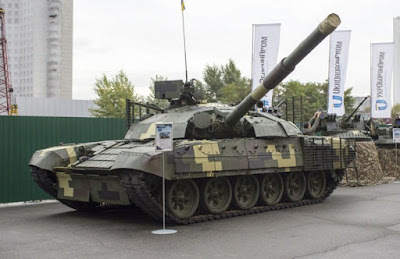 The BTR-4MV1 has completed factory tests and the T-72AMT is currently undergoing company trials. Work is also underway to adapt the vehicles in Ukrainian service to make them more compatible with NATO standards. ”Other systems to have completed development in 2017 include the 80K6T air defence radar, which is in the process of entering trials. The system is a 3D radar that can operate with any missile-based air defence system in Ukrainian service, in addition to providing an information link for the Ukrainian Air Force. The report also mentions Project Vil’kha, which from the description appears to be a Ukrainian programme aimed at developing the precision-guided missile technology available to the Ukrainian armed forces. The report states, “throughout 2017, the Ukrainian military conducted scheduled trial launches of Ukrainian missiles under project Vil’kha, manufactured by enterprises of the State Concern UkrOboronProm in co-operation with the State Space Agency of Ukraine."